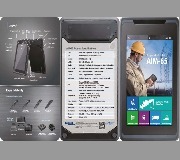 Taipei, Taiwan, June 28 2018 – Advantech, a leading industrial computing platform provider, is pleased to announce its AIM-68 10” industrial-grade tablet. Powered by an Intel® Atom™ x7-Z8750 processor with support for dual OS, AIM-68 is aimed at diverse applications in various vertical markets. With its compact and lightweight design, multiple I/O ports, and application-oriented peripherals, AIM-68 provides the portability and flexibility to satisfy various demands in a wide range of usage scenarios. AIM-68 also features a 2-megapixel front camera and 5-megapixel rear camera with auto-focus, 4 GB of memory, 64 GB of storage, and a 10” WUXGA IPS full HD LCD display with scratch-resistant Corning® Gorilla® Glass 3 and multi-touch PCAP control. The high-brightness display ensures readability in direct sunlight for outdoor applications. The inclusion of Wi-Fi, Bluetooth, WWAN, and NFC wireless communication technologies supports real-time data transmissions and GPS tracking, which are essential capabilities for field service operations. Moreover, with its wide operating temperature range (-10 ~ 50 °C) and IP65 rating for protection from dust and water ingress, AIM-68 has the durability to withstand operation in extreme in-vehicle/outdoor environments. The embedded hot-swappable 26 WHr battery supports 5 ~ 6 hours operation for long-duration use and can be recharged via a docking station. In addition to the standard I/O, which includes 1 x micro HDMI, 1 x USB 3.0, 1 x combo audio jack, 1 x DC-in jack (19 V), 1 x SIM card reader, and 1 x micro SD card reader, AIM-68 offers 2 x extension ports (via 1 x AIM extension 14-pin pogo connector and 1 x AIM dock 16-pin pogo connector) for integrating diverse peripheral modules. These optional extension modules and accessories include an in-vehicle docking station, VESA mount dock, 1D/2D barcode scanner, UHF RFID reader, and RJ45+COM module that can be integrated to provide customizable application-specific solutions for mobile field service, warehouse and logistics, and in-vehicle fleet management. For example, for field service applications, the camera module can be used to capture images for real-time reporting. Workers can also make video calls via WWAN to the service center for assistance. For fleet management applications, WWAN and GPS capabilities allow drivers to record, monitor, and schedule driving routes. Additionally, data can be transmitted to the control center for real-time vehicle diagnostics and driver behavior monitoring. For utility-related applications, because most maintenance engineers work long-duration shifts in remote locations, they may not have the opportunity to recharge the battery. The support for battery hot-swapping allows engineers to change the battery without interrupting their work. Aimed at diverse applications, the AIM-68 industrial-grade tablet features a 10” WUXGA IPS full HD LCD display, programmable function keys, and multiple I/O, including 1 x micro HDMI, 1 x USB 3.0, 1 x combo audio jack, 1 x DC-in jack, 1 x SIM card reader, and 1 x micro SD. To satisfy field service and fleet management demands for real-time management and data transmissions, AIM-68 is not only equipped with 802.11 a/b/g/n/ac Wi-Fi and Bluetooth capabilities, but also 4G/LTE and GPS technology to support asset tracking for resource and dispatch management. The built-in NFC reader, front and rear cameras, as well as optional 1D/2D barcode scanner and other add-on modules offer multiple tools for easy data collection to optimize operations. Like the 8” AIM-65 tablet from the same product family, a key advantage of AIM-68 is its high expandability for diverse applications. The tablet can be equipped with a wide variety of application-oriented peripherals, such as a 1D/2D barcode scanner or RJ45+COM module, to extend the system functions according to specific usage requirements. Additionally, three types of docking stations (desk, VESA mount, and in-vehicle docking stations) have been developed for the tablet to enable deployment in different operating environments. These docking stations feature additional I/O ports and are capable of recharging the tablet to extend the system usage period. The AIM-68 tablet offers dual OS support for both Windows10 IoT Enterprise and Android 6.0. This allows customers to select the most appropriate OS according to specific application demands and usage behaviors and deploy unique application software. Furthermore, to deliver high-performance computing, AIM-68 is also equipped with Advantech’s industrial-grade Android OS, which provides a reliable application framework and user-friendly tool for conducting remote control and diagnostics, enterprise management, OTA programming, and module extension operations. 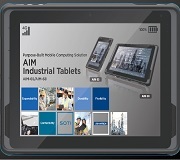 Advantech’s AIM-68 10” industrial-grade tablet is available for order now. For more information regarding AIM-68 or other Advantech products and services, please contact your local sales support or visit our website at www.advantech.com.